Very Motivated Seller! 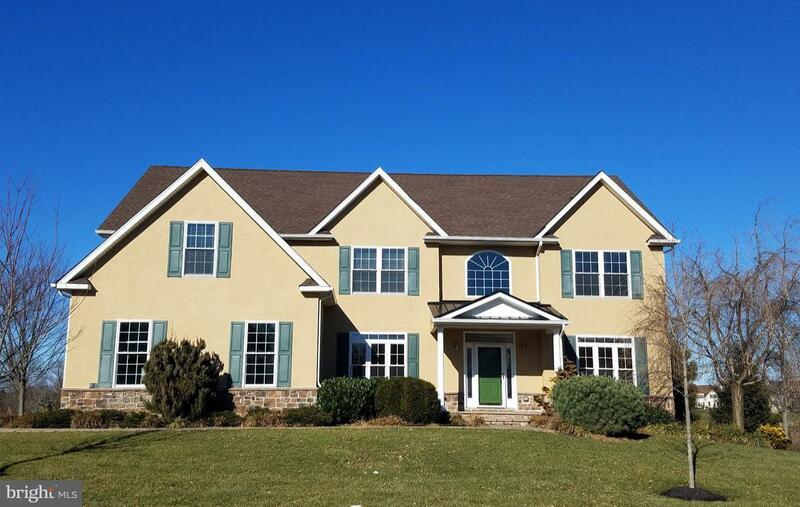 Beautiful Luxury Stone and Stucco Center Hall Colonial home with Golf course view. Enter via the two story foyer with a turned Oak staircase and Oak hardwood floors. The first floor features a Formal dining room with Crown and chair rail moldings. The home has a formal living room for entertaining and a quiet rear den/office. Large eat in kitchen with granite counter tops, ample 42" Maple cabinets and an adjoining eat in area. Sliding doors lead to the maintenance free deck overlooking the private fenced rear yard and view of Lederach Golf club. Cozy two story Family room with warm gas fire place. There are hardwood floors throughout the first floor, second floor hallway, and the main bedroom suite. The second floor features a large Master Bedroom suite with walk in closet, master bath with whirlpool tub, glass shower and double sinks. There are three additional bedrooms and a full hall bath with ceramic tile. Extra space in the full walk out finished basement which feature a beautiful ceramic tile floor, large family room and a separate theatre room complete with projector, screen and surround sound wiring for your home movie viewing. The property has been professionally landscaped with completely fenced rear yard. Fully automatic power awning on the deck complete with wind guard and a shady slate patio under the deck. Listing courtesy of Re/Max Homepoint.